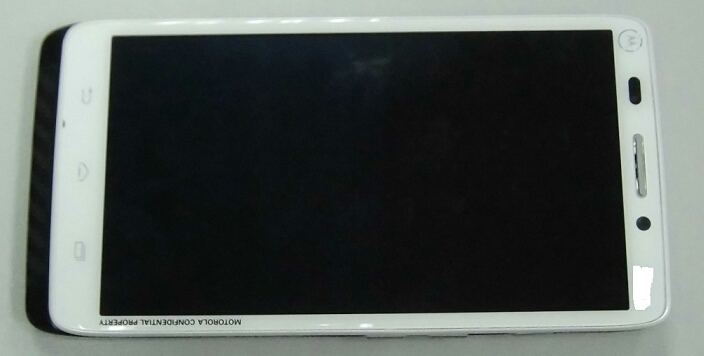 Yesterday, we saw the Motorola DROID MAXX on its way to Verizon in a first press render. Today, we’re potentially looking at the DROID ULTRA in white (XT1080), also on its way to Verizon as the other brother. No other details were provided by XDA forum member xavierk75, the person responsible for the photo, but it certainly looks a lot like the MAXX. The first thing that stood out was the entire white face plate. The ULTRA is rumored to be available in white, black and red when it hits Verizon stores, so that’s a good starting point. Motorola has in the past not gone completely white with phones though, and has instead left fronts black and then added colorful accents to outer rims or backsides of phones. Again, this is the “new” Motorola, so anything is possible. The second thing we noticed were the hardware capacitive navigation buttons of Home, Back, and Multi-task. These were present on the DROID MAXX picture yesterday, and are a major change in design for Motorola when compared to all of their phones from last year. Over the past twelve months or so, we saw Motorola adopt Google’s new stock standard of having on-screen software navigation keys, but at some point they must have decided to change that. Well, the Moto X will more than likely still use on-screen keys, just not these new DROID branded phones for Big Red. Other than those two things, the phone looks a lot like last year’s RAZR HD. The bezel is semi-thin, but not industry-leading. We’re also seeing a front camera to the right of the speaker grill, along with an area for housing sensors. The side houses the volume rocker and power/lock switch, just like the last couple of year’s of Moto phones have. And that’s it. The picture doesn’t necessarily give off any indication of the screen size or type. The rest of the specs remain a mystery as well.